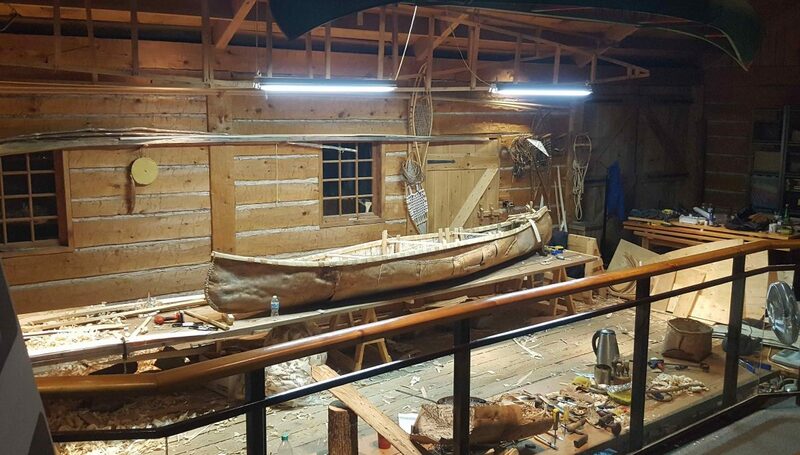 For a few weeks in September, Chuck Commanda taught a group of young people how to build a birch bark canoe at the Canadian Canoe Museum. When I arrived to interview him, they had almost finished building it. The boat lay in the middle of the museum’s skills workshop and looked like it was nearly ready to hit the water. The ground was covered with wood shavings and the builders were idly picking away at little bits of wood that needed to be shaped to go into the canoe. Chuck told me about how they had taken the bark off of the tree for this canoe — carefully, but also quickly. And about the work they had done to get the canoe put together. He also told me about how he learned how to build canoes and learning from his grandparents. In fact, in order to get to the skills workshop I passed a canoe that he had built in his childhood with his grandparents. He took me back to that canoe and told me more about it. I had a lovely time speaking with Chuck and getting to know him a bit. I’ve been thinking a lot recently about Canada’s relationship to the canoe and my own relationship. Seeing the process for how it was built and speaking with Chuck shed some light on how he felt about it, as well as how he was channeled into that type of work. He had initially connected with basket-weaving as a way of reconnecting with the memory of his grandmother and with his culture, but in some ways the way he could make a living off of this work was in canoe building. And as beautiful as his canoes are, I wonder if settler Canadians have a certain fixation with this type of boat. In any case, Chuck spoke to me about the contentment he gets from doing this work, and I’m grateful that he spared the time for me.